Harappan Civilization & Square of Saturn Aspects. Harappa was part of an Indus Valley Civilization . The square of three of Saturn, pictured above, was preserved in ancient cultures worldwide. Ancients connected this square with the planet, Saturn. Both measurement and engineered are derived from this number square. Why? I believe it goes back to a destroyed civilization that predates recorded history. Perhaps it was Atlantis? Plato wrote of the reality of this legend. Generations of survivors made an attempt to preserve their knowledge of Atlantis through this number square. It was once the ideal behind a Golden Age. 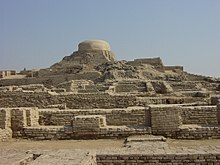 Harappan civilization coincides with what is Pakistan and northwest India today. It flourished over the fertile flood plain of the Indus River and its vicinity. Religious practices of the Indus valley culture date back to approx. 5500 BCE. The ruins of Mohenjo-daro were designated a UNESCO World Heritage site in 1980. Indus Valley Cities: Quick Links. Harappa and Mohenjo-daro were built on uniform grid-plan blocks. They had town planning and standard streets. Even houses were set out by a code. By 2350 B.C. the two cities were well established. They traded by land and sea with the Summerians. Harappa’s citadel parallelogram is 645 from east to west. It measures 1380 feet from north to south. On length and width totals 2025 feet. This figure squares forty-five as: 45² = 2025. Look at the 3 x 3 number square. The nine numbers total 45. This is one way the civilization drew on the 3 x 3 number square. Here’s a second: Just North of the citadel was the state granary. It measured 150 feet from east to west. The North to south width was 75 feet. One length and width totals 225 feet. Look at the 3 x 3 number square. Any row of three numbers totals 15 feet. Thus, 15² = 225. There are many other parallels which will be the subject of future blogs. The internal link below offers one example of the depth of the 3 x 3 number square.